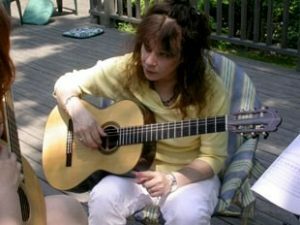 I began playing the guitar at 14, and at 17 I began my teaching career. It has been over 45 years now, and I have sat across from thousands of students, helping them learn the guitar, and giving them what they need to be successful in their efforts to become guitarists and musicians. It does not matter to me what age the student is, what style they want to play, or whether they are beginners or long time players. It does not matter to me whether they wish to simply come home from work at night and strum and sing their favorite songs, or become rock stars or concert artists. My job is to hook each student up with their own musical satisfaction whatever form that might take. My job is to make sure they understand how to get good on guitar, and how to keep getting better. My job is to do for them what I have always done for myself, create a happy guitar player! Jamie as a "Guitar Player"
Playing the guitar is the reward we receive for the practice we do, and it is a wondrous reward indeed! If we are dedicated to our practice, and striving always to make it the intense communion with our instrument and our music that it needs to be, that intensity will be revealed in our playing. When you watch someone play, you are not only hearing the music they are making, you are also seeing the nature of their relationship with music itself. You are seeing the results of every moment they have spent with the guitar, and every feeling they have about themselves, and their music. 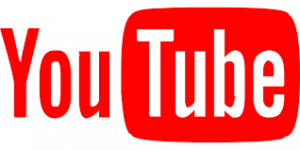 ​Watch me play on my YouTube Channel! "What you are as a person is what you will be as a guitarist"
The fastest and surest way to succeed on playing guitar is to take lessons directly from Jamie. 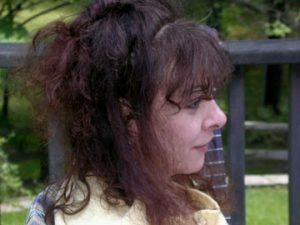 She is famous for her ability to watch a student play, and immediately diagnose the reason for a students's difficulty, no matter what style of guitar. Better yet, she knows exactly what the student must do to solve that problem. The fastest way to revolutinize your playing! Meet with Jamie face to face. You will have 40 minute session with Jamie on the Zoom platform. She will address your specific needs to reach your next level of playing ability and all lessons are tailored to your goals as a guitarist. You will be overall evaluated, and given instructions on what you need to do next to overcome the greatest technical obstacles that you presently have. All study materials provided, including the priceless "Principles Foundation Training". You send me videos of your practice, I send you a "mini-lesson" tailored exactly to you at the moment. A lot of things you do in Las Vegas could be a gamble. But if you come here to take a lesson with Jamie, your guitar playing will surely hit the jackpot! Webcam lessons with Jamie are 40 minutes each. She will address your specific needs to reach your next level of playing ability and all lessons are tailored to your goals as a guitarist. You will be overall evaluated, and given instructions on what you need to do next to overcome the greatest technical obstacles that you presently have. There is no frequency requirement, but the more you see Jamie, the faster you will improve! Some students take a lesson each week, some every other week. 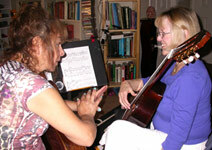 If you want to get a feel of a lesson with Jamie, schedule a single lesson and then decide how it will work for you. Schedule: Mon.-Thurs. & Sat. all time zones. “Even though I have had requests for webcam lessons for many years, I was always reluctant to do them. I really did have doubts as to the effectiveness of them, and also wondered whether I would enjoy working with a student that way. Well, I am glad I always make a habit of testing my assumptions! After having given hundreds of webcam lessons with a variety of students, I have been very pleasantly surprised, even amazed, at how effective they are. I have found that my ability to spot the problems with a student’s technique, to analyze the problem, and to prescribe the cure is virtually unhindered by the long distance aspect of the lessons. I guess I have been doing this a long time! It has been extremely gratifying for me to be able to work with people who would otherwise not be able to deal with the logistics of traveling for lessons. I am now convinced of the great benefit to the student, and so I feel I can get behind the idea of webcam instruction with me without reservations. In addition to diagnosing student problems, I find there is a great benefit by the simple fact of contact with the student. I am able to observe their practice, and find the flaws in their understanding of correct practice. It can save the student years of frustration. What my Students Are Saying? What do our past students think of the webcam lessons? 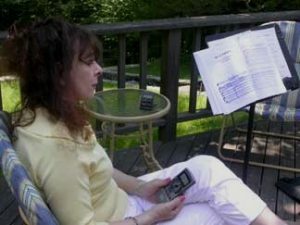 "I feel fortunate to have discovered a way to take lessons with Jamie even though I am thousands of miles away in Maine. Webcam lessons have provided me that opportunity. It is as good as being in the same room! I have never been made so aware of exactly where my fingers are supposed to be and where the tension is that I need to eliminate. I look forward to each lesson…"
"It never ceases to amaze me at how profound and exhilarating a webcam lesson with Jamie can be. She really gets to the root of your difficulties and shows you exactly how to get through them. I always come away from her lessons with a whole new sense of direction and purpose. One lesson with her is worth more than 10 lessons anywhere else." Study with me personally on a powerful internet teaching platform which ​gives you the frequency of feedback so essential to the development of solid guitar skills! ​When you sign up for my guitar classroom at TrueFire.com, you can send me videos of your practice efforts on a daily or semi-daily basis. This prevents you from practicing wrong! ​Your subscription to this classroom also gives you access to Truefires vast catalog of instructional material. 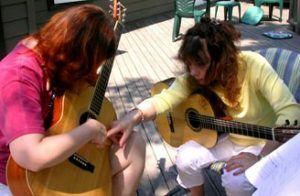 On your own, you would find it difficult or impossible to actually learn the material in these courses, but with my guidance, you can learn any style of guitar you want! I WANT TO SIGN UP FOR JAMIE'S TRUEFIRE CLASSROOM! Guitar students have no idea what it takes to play like a pro. Fortunately, I do, and so I require my students to do what the pros do to play the guitar so well and so easily. One very important thing is the constant REALITY BASED evaluation of their skills, which is a necessary pre-requisite for improving those skills. This means constantly recording yourself and evaluating your playing. 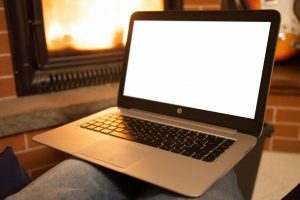 In my Online Classroom, we are uniquely set up for that, because students can easily video their practice efforts right from the browser, submit it to me, and I can just as easily send them back a personalized video response, telling and showing them exactly what to do to solve their problems, and exactly how to do it. This is awesomely powerful, because of the fundamental (scientific) principle of "motor control learning"....receiving feedback and correction on efforts is ESSENTIAL to improvement. 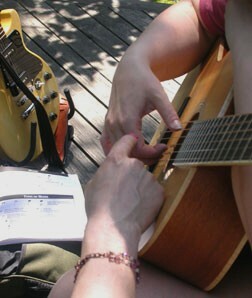 You can't change what you don't know is wrong, and if you are not getting better on guitar, you are practicing wrong! In my classroom, you have access to my most powerful methods for building real guitar playing ability, and you have my personal attention on a daily basis - you will not believe the progress you will make on a weekly basis! 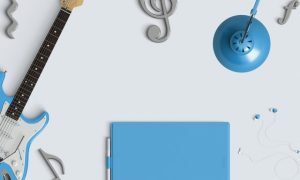 Access to the essential teaching materials of “The Principles System For Guitar”, including the Foundation Training from “The Principles of Correct Practice For Guitar”. ​ Access to Truefires vast catalog of instructional material. Top guitar pros offer you their knowledge in hundreds of courses, and I show you how to get YOUR fingers to do it too! "Results speak volumes when it comes to assessing the skills of a teacher." Fourteen months ago, I joined Jamie's Online Classroom and begin lessons with her. As a baseline, I accompanied my songs with a couple of basic strums and open chords at that time. What now? I play chromatic and major scales in 16th notes using a metronome set at 60, bar chords using a variety of strategies with no crippling tension, several different strums and picking patterns to accompany my songs, bass runs to add variety to my rhythm playing. 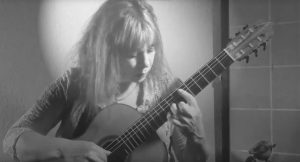 I have developed many right hand skills for fingerstyle accompaniment and for playing beautiful melodies and classical repertoire. I could add more to this list. Most importantly, Jamie has taught me how to practice so I get results from every session without any frustration. I am excited about learning the guitar! Can't wait to see what develops during Year 2 of my lessons. Thanks, Jamie. Teaching is your gift! If you're not getting better on guitar, then you are not practicing correctly...you are going in the wrong direction. When you are going in the wrong direction, you don't wait another 100 miles before you turn around! 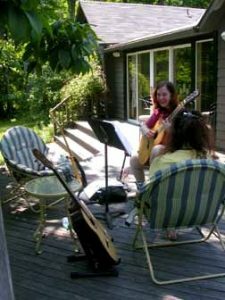 One of the biggest mistakes guitar students make is thinking they should wait "till they get somewhere on their own" before taking a guitar lesson. What they don't know is that most of the playing problems that make playing a struggle start in the beginning and get reinforced every time you practice! If this is you, then you need a "direct intervention". What do In Person Lessons with Jamie look like? Jamie & Leanne getting ready for a lesson. 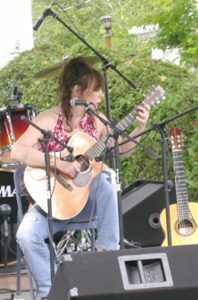 Leanne has been working on the guitar part to "Blackbird" by the Beatles. Jamie listens and watches while Leanne plays. Jamie notices a common problem in the right hand. Jamie demonstrates relaxed functioning of the fingers on the problem passage. Jamie points directly to the finger that is mis-behaving. We must know exactly what finger is causing a problem when fixing our playing. After going over the correct motions with the problem finger, it's back to working up the speed on the passage. Jamie's lessons are always intense, focused and fun! The areas we covered over the 5 days were pretty much up to me to decide, with Jamie only making a few suggestions about things she wanted to check up on. I came away with a lot to digest and work on, and feeling much more confident about what I've got to do to solve the problems I have now, and continue to improve my playing. 40 minute face to face sessions via Skype. Connect with Jamie from anywhere on the globe. Jamie will diagnose your obstacles to progress, and guide you step by step on how to practice to overcome them. You will be amazed at your progress! 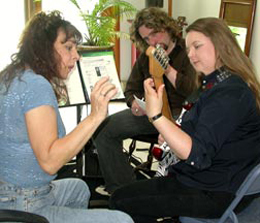 ​Your guitar progress is under Jamie's personal supervision every step of the way! Frequency of Feedback- students are allowed unlimited video submission. Jamie's constant feedback is the key to amazing progress! You submit a video of your practice, Jamie sends you a detailed personal video response, showing you exactly what you need to do! Bad practice is eliminated! Access to 100's of truefire guitar courses in all styles. Jamie regularly guides students through the difficulties of learning them. Learn guitar while enjoying the night life of Las Vegas. Meet Jamie in person and change your guitar playing life forever. 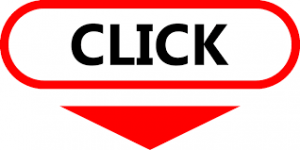 The quickets, surest, and most powerful way to reach your guitar playing dreams! Lessons are scheduled Mon/Tues & Thurs/Fri/Sat afternoons. A two hour lesson is scheduled for Mon,Thurs & Saturday and a one hour lesson for Tues and Fri for a total of 8 hours. Two lessons are scheduled, one each day with an overnight stay. Lessons are two hours each for a total of 4 hours. Sat/Sun rates are slightly higher. Afternoon and evening appointments are available. One lesson for an hour, an hour and a half, or two hours duration. Mondays through Saturdays. Special needs may be accommodated, including extended study. Contact Geraldine. Review "The Schedule" to see which Plan you are interested in. Then, email Geraldine with some idea as to the time frame that you have available. Most consultations are scheduled at least a month in advance. If you know your schedule way ahead, as you’re planning your vacation time in advance, then email right away to guarantee the exact reservation that you want. Cost information will be e-mailed to you upon your inquiry.